TDC are thrilled to be involved in delivering a fantastic new art project for 11-19 year olds which begins on Friday 1st March. The project is linked to the new archaeological exhibition at Brighton Museum which includes artefacts dug up in Brighton and skeletons which are thousands of years old. Some of the artefacts come from Whitehawk Hill which is recognised locally as a special nature reserve. 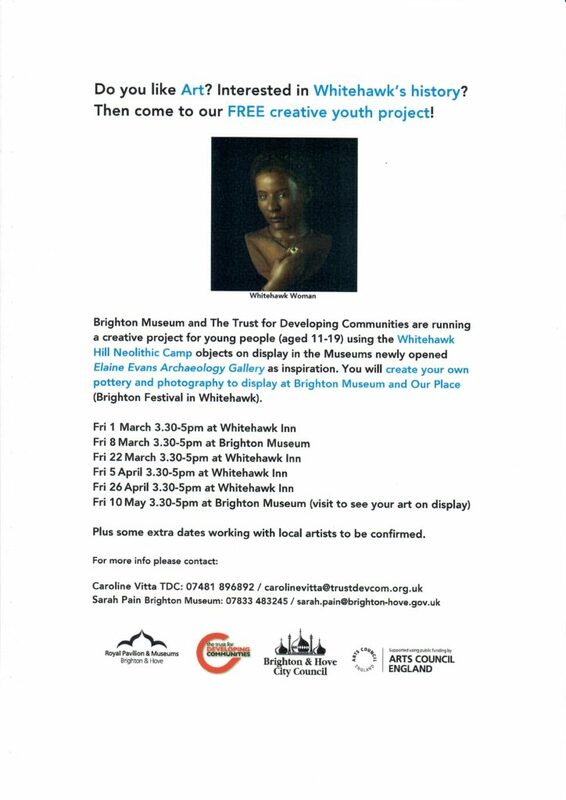 One of the skeletons included in the exhibition was also dug up in Whitehawk and a 3D reconstruction of her face is featured. Young people don’t need to be great at art or history to take part – they will learn all the skills needed on the project. We are currently looking for young people who can commit to seeing the project through to the end. There are only 8 spaces available so please get in touch with TDC’s Caroline if you are interested – by phone 07481 896 892, by email [email protected] or you can search for Caroline Tdc Youthworker on facebook. Plus some extra dates working with local artists to be confirmed. For more information about the exhibition, visit the Brighton museum website.